Shopping for Sports: Wrestling Playsets? 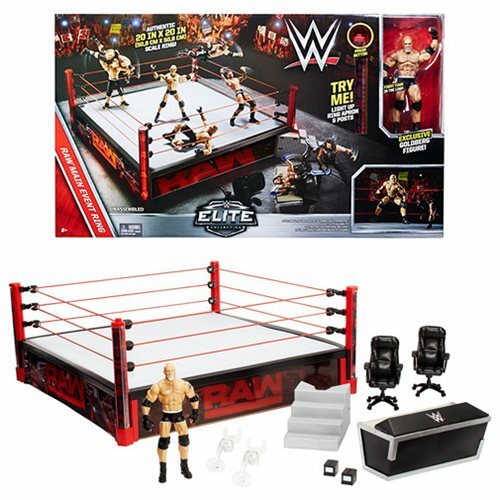 Get ready for some intense WWE action with this WWE Elite Authentic Scale Raw Main Event Ring Playset! This impressive playset features real working LED lighting and is authentically scaled at 20-inches x 20-inches for 6-inch figures. Its impressive size makes it great for multi-battles and the easily controlled lights pump up the intensity even higher! This playset includes the authentically scaled ring, a ring announcers' table, two chairs, ring steps and a high quality ring canvas! It also includes one exclusive 6-inch tall action figure of WWE Superstar Bill Goldberg, which features multiple points of articulation, detailed character expressions and authentic ring attire. 3x "AA" batteries are required for operation (included). Ages 8 and up.